People visiting Los Angeles think of Santa Monica for the beach and its famous pier, but there are plenty of things to do in Santa Monica, even if you're not a beach person. From shopping and nightlife to art appreciation, quirky museums and pampering spas, there's enough to do to entertain you for a day, a weekend or a week or more, depending on your interests. Health and wellness is a big focus of the Santa Monica lifestyle, so it's a favorite retreat for people who just want to relax and healthily pamper themselves. It's one of the places in greater LA where it's easy to settle in for a few days and start feeling like a local. 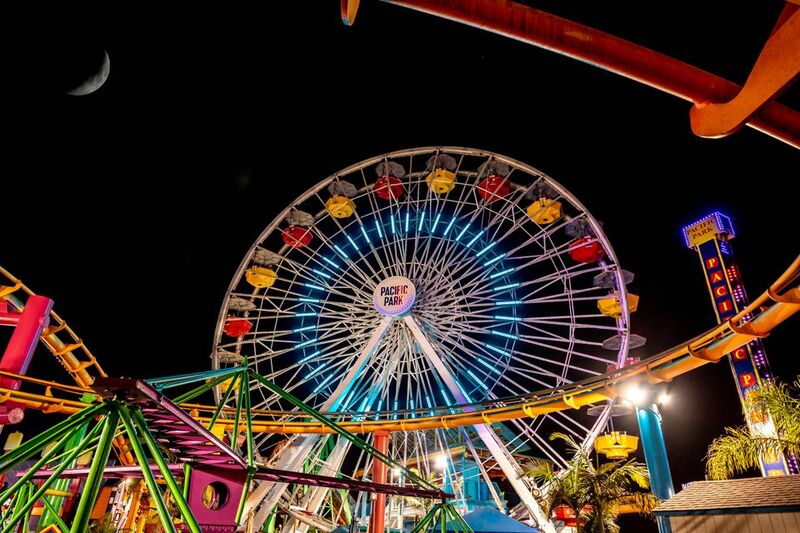 There are tons of things to do right on Santa Monica Pier. It is home to Pacific Park, a mini-amusement park with a Ferris Wheel, a small roller coaster and some other small rides. There's also a separate carousel and a food court. It is also home to the Santa Monica Pier Aquarium, the New York Trapeze School. In addition to the food court, there are also several restaurants. Summer concerts are held on the extended south side of the pier. Other than what's going on at the pier, Santa Monica Beach is one of the most famous beaches in the LA area for just enjoying the sun, surf, and sand, as well as many other activities you can do on the beach or the water. Santa Monica Pier Aquarium is a small aquarium of Pacific sealife run as a marine education center by the non-profit Heal the Bay. It is located at the foot of the Santa Monica Pier. It's nowhere near on the scale of the Aquarium of the Pacific in Long Beach, but the aquarium showcases more than 100 sea animals and plants found in the Santa Monica Bay, with lots of sea creatures you can touch. Third Street Promenade is one of the L.A. area's favorite pedestrian shopping zones. Street performers provide a festive atmosphere on evenings, weekends and daily during the summer. Unfortunately, many of the unique shops and food stalls that gave the Promenade its charm have been replaced by chain stores and restaurant franchises, but it's still a lively place to be. The pedestrian zone stretches three blocks from Broadway at Santa Monica Place to Wilshire Blvd. A free activity that draws fitness buffs looking for a good workout is the Santa Monica Stairs. There are two sets of very steep stairs from Adelaide Drive at the top to Entrada Drive at the bottom. If you search Google Maps for the Santa Monica Stairs, it will take you to 699 Adelaide, which is the house across from the top of the stairway pictured here. There is free street parking at the top and bottom, but since most people go to Adelaide, it's sometimes easier to find parking on Entrada and start at the bottom. The Marvin Braude Beach Trail, better known through Santa Monica as "the Strand," is a 22-mile paved trail that runs from Will Rogers State Beach just north of Santa Monica to Torrance Beach in the south. There are plenty of places to rent bikes or skates to spend an hour or all day biking or skating along the miles of paved beach path south as far as Redondo Beach and north to Malibu. There are at least three bike and skate rental shops with varying equipment right on or near the Santa Monica Pier. Surfing is allowed between lifeguard towers 18 and 20 (Pico Boulevard and Bay Street), and between 28 and 29 (Ashland Avenue and Pier Street). There are surf schools and private instructors for beginners through advanced surfers, and rental equipment available. Always check with lifeguards before surfing. Santa Monica Place has some unique shopping and dining opportunities, sometimes disguised behind familiar names. Bloomingdales and Nordstrom at Santa Monica Place both carry fashions and accessories by local designers, and Bloomingdales has over 100 pieces of original art on display. Rooftop dining elevates a variety of cuisines to a memorable experience. The Museum of Flying is located on the grounds of the Santa Monica Airport. Founded in 1976 by Donald Douglas, Jr., the second president of the Douglas Aircraft Company, the museum opened in its current location in 2012. It features some exhibits related to Douglas Aircraft Company, as well as other historic planes, replicas, and models, including the Douglas DC-3 Spirit of Santa Monica out front, built at Douglas Aircraft in Santa Monica in 1942. There's also a cockpit of a FedEx plane that you can climb into. The Annenberg Community Beach House is a public swimming pool, community center, and gallery located right on the beach at the north end of Santa Monica State Beach. The property initially featured a 100-room mansion that William Randolph Hearst built for Marion Davies in the 1920s. It went through various incarnations as hotel and beach club over the years. The villa itself was torn down in 1956, but the beach club continued operating until the 1994 Northridge Earthquake. After that, the City drew up new plans but lacked funding to implement them until Wallis Annenberg of the Annenberg Foundation came to the rescue and provided grant funding for the project. In 2009, the Annenberg Community Beach House opened with the historic pool and the Marion Davies Guesthouse restored to their former glory and brand new recreation and event spaces. There are beach volleyball, tennis, and soccer courts available. Some can be reserved for a fee; others are free on a first come basis. The 538-seat Broad Stage (pronounced "brode") at Santa Monica College's Performing Arts Center is the largest and the most technologically advanced performing arts space currently operating in Santa Monica. There are two theaters: The main Broad Stage and the more intimate block-box theater, The Edye. Performances range from classical to cutting-edge, across theater, dance, music, and more. The Camera Obscura is a quirky thing to do in Santa Monica, but it will amuse photographers and other physicists. If you're not familiar with the concept of a Camera Obscura, it's a dark room that acts as the inside of a camera by letting in a controlled amount of light. The light beam projects an image of the scene immediately outside onto a plate in the dark room. In this case, the light source is a periscope on top of the building that you can move around to face the ocean or the street. The image of the scene outside is projected on a circular plate-like a table in the middle of the room. You tip the table to adjust the focus. The Camera Obscura is part of is part of a community center in Palisades Park at 1450 Ocean that used to be predominantly a senior center but is now the Art Lab, offering all-ages art workshops and fitness classes. California Heritage Museum is a historic residence in the heart of Main Street that presents exhibits of American decorative and fine arts. The improv, stand-up and variety club has gained a firm fan base since they opened in an alley behind the 3rd Street promenade back in 2009.